Dako, an Agilent Technologies company, is a world leader in anatomical pathology, with a wealth of experience in immunohistochemistry (IHC) and in situ hybridization (ISH) testing. To meet the needs of pathologists and clinical laboratory personnel around the world, Agilent was looking to offer a new platform that provided their customers greater capacity, higher throughput and more cost-effective processing. In 2011, Agilent chose to partner with Tecan to develop and manufacture a complete solution for fully automated IHC/ISH staining, and the Dako Omnis platform – launched in 2013 – was the result. 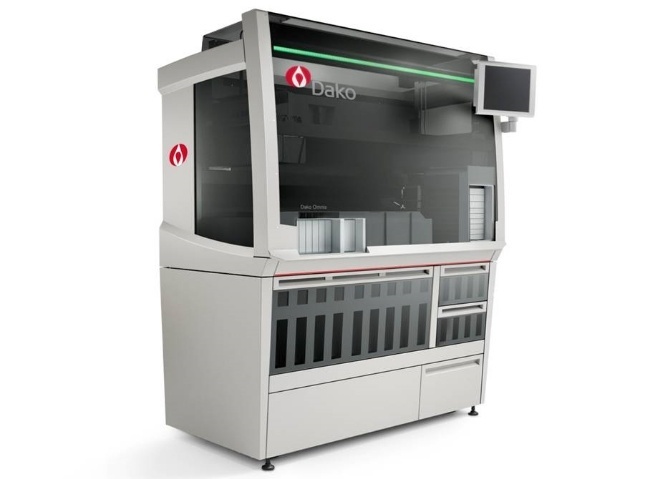 Dako Omnis is designed to offer laboratories the capacity to deal with increasing sample volumes at a time when personnel and financial resources are under increasing strain. Its exceptional on-board reagent and sample capacities make it a true walkaway solution, with a carefully controlled environment to provide consistent, high-quality staining of up to 165 IHC slides or 45 ISH slides in a typical workday, including unattended overnight processing. Dako Omnis – More time. Greater choice. Better patient care. The Dako Omnis software offers seamless integration with upstream and downstream laboratory processes, as well as hospital laboratory information management systems, providing a robust IHC/ISH platform. Its intuitive interface was developed with the support of pathologists, helping to simplify day-to-day processing and enabling staff to use their time more efficiently. Tecan has proved an ideal development partner for the Dako Omnis system. The company’s considerable expertise in system integration perfectly complements our extensive application know-how and experience with end-user customer workflows in the IHC and ISH segment. Tecan shares our values of innovation and ownership, and we have established a close working relationship from the outset, with a continuous, open dialogue between the project teams helping to bring Dako Omnis to the market faster.